At Bryant Park we strive to make users as comfortable as they would be in their own living rooms. We want them to relax, have fun, and spend as much time as possible outdoors. We are always looking for solutions that improve the experience for everyone in the park. In this case we noticed that most park users carry smart phones and tablets with unpredictable battery life. 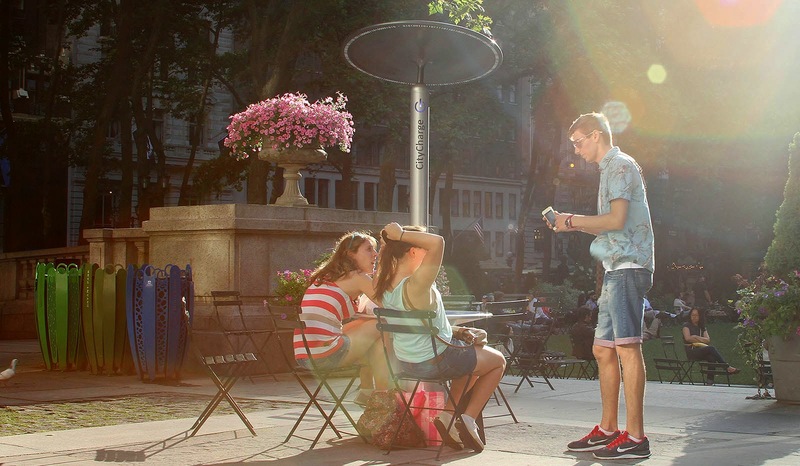 A low battery indicator can spoil the experience of anyone trying to enjoy a public space. When a technology company approached us in 2012 with their proof-of-concept for a solar-powered charging station, we decided to collaborate with them to turn the idea into a viable product. The concept seemed like a great partner for our free park Wi-Fi, launched in 2002, and our network of 40 wired charging outlets, launched in 2012. 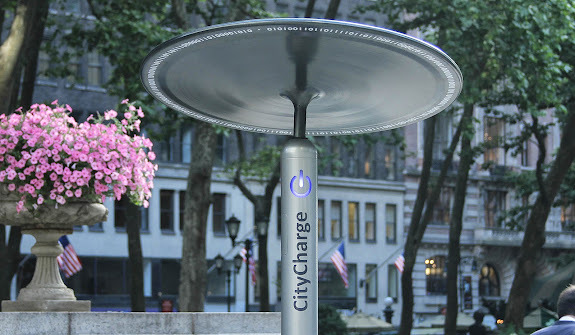 CityCharge is the result of two years of product development collaboration between, Bryant Park Corporation, Green Barrel Energy Inc., a New York City based solar company, and Landscapeforms, USA’s leading manufacturer of high quality street furniture. 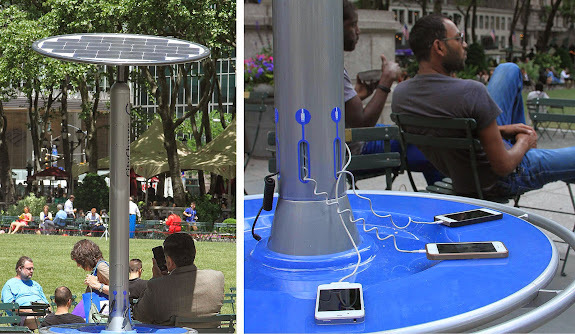 This urban grade solar-powered charging station comes equipped with six charging cables that can accommodate most electronic devices. The machines are movable and powered entirely by solar energy. “We are extremely excited about the launch and pleased that the prototype testing in Bryant Park is going really well,” said Tommy Mitchell, Green Barrel Energy Founder and CEO. This summer, Green Barrel Energy plans to install six additional machines in Bryant Park and continue its expansion in New York City and other areas in the US. 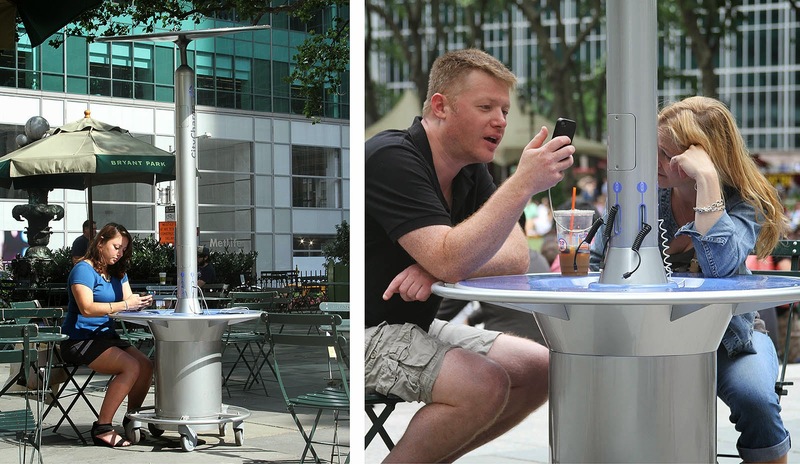 Ciocchini, who leads the in-house Design Department for Bryant Park Corporation, also designed the tulip trashcans in Bryant Park and the CityBench for the NYC Department of Transportation. 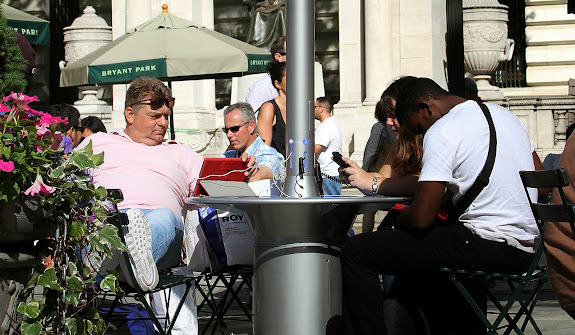 “The product features a blue polycarbonate table that is soft on phone casings and visually connects the product to the sky and nature, where the power comes from,” he added. CityCharge fits right into any public space and works well with existing chairs, tables, and umbrellas. It has five wheels on swivel casters with brakes so it can be easily repositioned to make room for events, programming, or maintenance activities. It has a solar panel that can be manually rotated to point South, and an internally illuminated power-icon that indicates when the unit is turned on. All the electronic components can be remotely monitored via proprietary web software. These features make it an ideal choice for any public space manager. Green Barrel, Bryant Park, and Landscapeforms are currently developing improvements for CityCharge based on product performance, user comments, and observations on how the public is interacting with the prototypes. The product design, hardware, and engineering teams are collaborating very closely and the resulting product will be commercialized by Green Barrel Energy in the near future. Bryant Park is one of the busiest public spaces in the world due to its enviable number of things to see and do. Movable chairs, an impeccable lawn surrounded by lush gardens and London Plane trees, beautiful allees, shady and sunny areas, good food, ping-pong tables, an outdoor reading room, a French inspired Carrousel, juggling, knitting, and language classes, are just some of the features of the park. Now you can add solar-powered charging stations to the list. This was an incredibly informative post! I came across the same sort of charger just outside of DC: http://wheresthesolar.blogspot.com/2014/12/communal-cell-phone-charger-in-rosslyn.html. A great product indeed. I am from Kenya and would really love to collaborate with Brynt Park to market this product here in our cities. Is this suggestion viable. PARECE UNA INTELIGENTE Y ADECUADA SOLUCIÓN, PARA UN PROYECTO QUE ESTAMOS ESTUDIANDO IMPLEMENTAR EN LOS PARQUES DE LA COMUNA DE PEÑALOLÉN, EN SANTIAGO DE CHILE. LES AGRADECERÍA ENVIARME INFORMACIÓN TÉCNICA DEL MÓDULO Y VALORES EN USD.